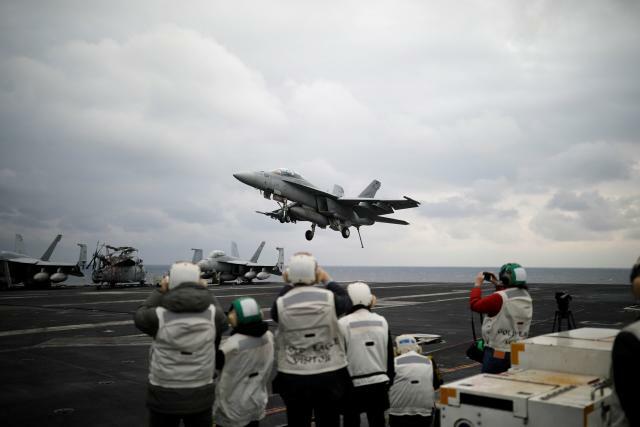 As the USS Carl Vinson ploughed through seas off South Korea on Tuesday, rival North Korea warned the United States of "merciless" attacks if the carrier infringes on its sovereignty or dignity during U.S.-South Korean drills. F-18 fighter jets took off from the flight deck of the nuclear-powered carrier in a dramatic display of U.S. firepower amid rising tension with the North, which has alarmed its neighbours with two nuclear tests and a series of missile launches since last year. 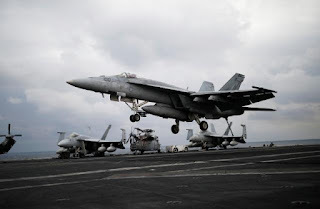 "While this is a routine deployment for the Carl Vinson strike group, really the centrepiece for us ... is this exercise we're doing with the ROK navy called 'Foal Eagle'," Rear Admiral James W. Kilby, commander of the Carrier Strike Group 1, told reporters, referring to South Korea as the Republic of Korea. China says the exercises do nothing to ease tension. Last week, it called on North Korea to stop its weapons tests and for South Korea and the United States to stop their drills.